Well whatever about the weather, from a workload perspective March definitely came in like a lion and it’s pretty much going out like a lion too! The good news is that the cloning project is going well and I should have three of myself to pick up the slack any day now 🙂 There’s lot bubbling underneath the surface at themesforge these days – much to the detriment of the blog unfortunately. Early in the month I finally got Part 5 of the High Performance WordPress series which brought that series to a conclusion but the rest of the month has been a bit of a blur with personal and business projects taking priority. In all the manicness I forgot to mention that we shipped our second commercial theme back in February! 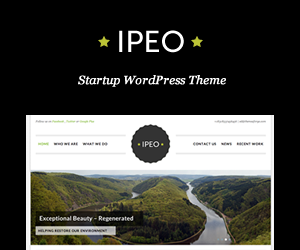 IPEO is a commercial WordPress theme that is designed specifically to meet the needs of startups looking to give their WordPress powered website a serious shot in the arm. It’s the second theme we’ve launched on the Mojo themes marketplace and it’s proved to be quite the hit in March I’m glad to say. So what’s the skinny on IPEO? Super fast loading markup and CSS – no bloatware! Lots of page templates including the now obligatory Portfolio template! Widget powered Homepage which makes it really easy to manage your homepage – no pesky shortcodes required! If you dig what we do here at themesforge purchasing our commercial themes is a great way of helping us pay the bills here. We don’t want to be the next Woothemes or StudioPress just yet but we love making themes and all things WordPress so your support is very much appreciated! Check out the demo or buy it on Mojo themes.